Yikes. Don’t raise the bridge, lower the river. It hadn’t occurred to me that Gibson might have simply shortened the headstock and caused all these other changes. Note the very precise high tech measuring device. 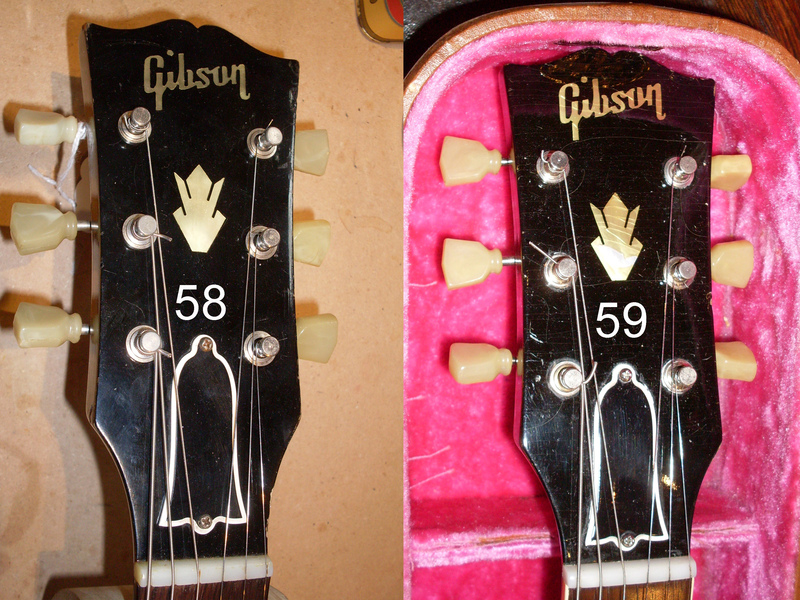 My friend Mike up in Victoria, British Columbia pointed out that the 58 headstock in the 58-59 comparison photo in my last post looked like it was elongated compared to the 59. Another reader (Roger) pointed out that maybe the tuners were moved rather than the inlay. I had mentioned that the truss cover had moved downward in 59. Well, I thought Mike in Victoria was on to something, so I did some measuring. The length of a 335 headstock is pretty consistent among the ones I have here in the shop. Unless it’s a 58. If you measure from the highest point of the headstock to the nut of a 59-66 ES-335 you will get a minimum of 6 3/4″ and a maximum of 6 7/8″. That’s a range of 1/8″ which isn’t much. I measured 7 different guitars from 59, 60, 64, 65 and 66. Then I measure the 58. It measures 7 1/8″. That’s a difference of a quarter inch or more. Who cares, you ask? Probably no one, but it points out that many of the differences between a 58 and a 59 are due to a longer headstock and not the migration of the various elements. There’s just less real estate and things have mostly only moved relative to the ends of the headstock. The inlay is the exception but the position of the truss cover and the tuners (and the logo) stay the same relative to each other. Now, I never thought the brass at Gibson was sitting around making microscopic changes to make their product better or cheaper but it starts making sense when one fairly big change starts a chain reaction of smaller ones. 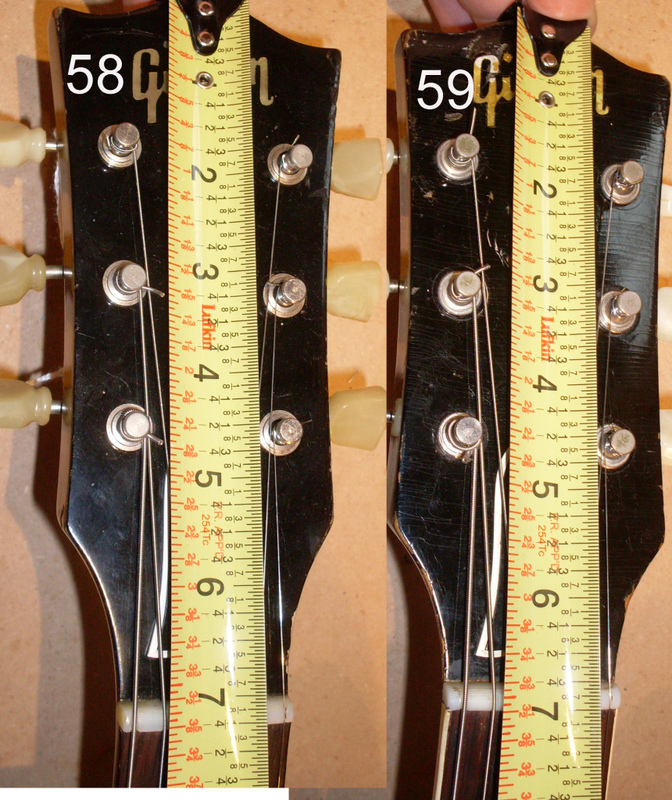 So, was the reduction in the size of the headstock a conscious change to make things better or cheaper? I couldn’t say but I can guess. My guess is that these early 335’s were largely hand made. The very neat routing in a 58 compared to the almost always sloppy routing in a 60’s 335 suggests this. I’m not a builder but I’m assuming that jigs were eventually made once the model was deemed successful in order to facilitate the build process. That would also explain the consistent Mickey Mouse ears you see from late 58 through mid 62. Too geeky by half? I suppose, but after this many posts, one has to start taking smaller bites out of the knowledge pie. There’s plenty of new information coming in the new year. I’ve been compiling a database of factory order numbers rtelative to serial numbers for 58, 59 and 60. It’s actually pretty interesting. I’ve been at this for a few months and I’d like to thank all the readers who sent me serial and FON’s to be included. It’s still ongoing so if you have a 58, 59 or 60 ES-335, 345 or 355, send me the serial and FON along with a little information (what model, color, tailpiece, bobbin color if you know it). Trying to reconstruct the thought and manufacturing processes at Gibson during this era is loads of fun. I suppose if I could find someone who was actually there who was involved in the day to day operations, it would be easier. Not so much fun but easier. OK, this is where I get really geeky. If you’re interested in the really little teeny details, the read on. Does it matter that the headstock inlay is a couple of millimeters lower in 58? Nope. But it is and I’m going to talk about that fact and some other silly little details that set our geeky little hearts aflutter. Just like the Les Paul guys. Gibson moved the “crown” inlay a few times over the years. The most notable was in late 66 when they lowered it about 3/4″. 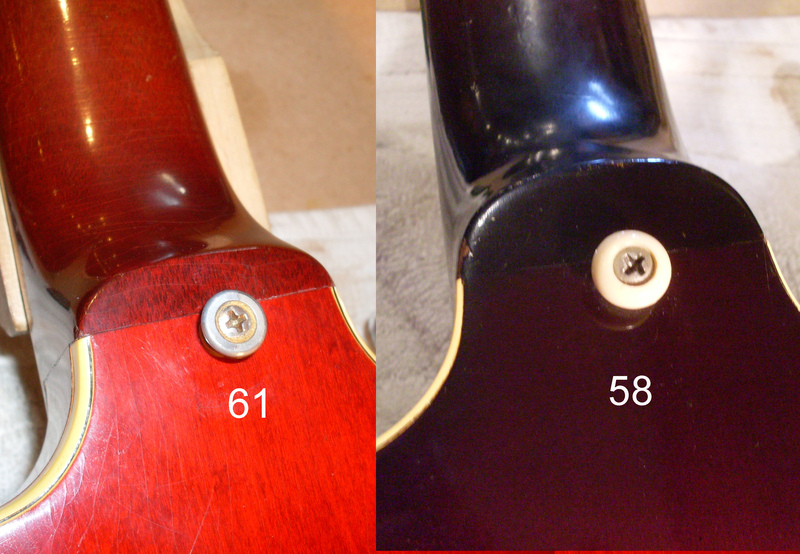 But between the earliest 58’s and the earliest 59’s the inlay was raised slightly. Not by much-maybe 1/8″ or less but this is what we do. I can’t imagine why they would do this but I’m sure it had something to do with the ease of the manufacturing process. There is a block of spruce between the maple center block and the top. Kerfed by 59 but not kerfed in 58. I’m not even certain that it’s spruce in 58. 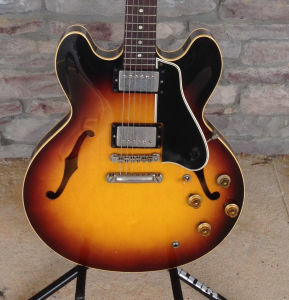 The invention of the semi hollow body guitar is a watershed event, I think. Even though the 335 was designed by Ted McCarty, the real credit should probably go to Les Paul. His “log” was, essentially, a 335. The maple center block-which makes a semi hollow what it is, underwent all sorts of changes over the years. It got shorter in the 70’s and lost it’s mahogany end blocks in the late 60’s. It also had a notch cut out of it in the early 60’s to make it easier to thread the harness into the guitar. But in 1958, another change occurred and I thought it might be related to the change in the number of plies in the top. 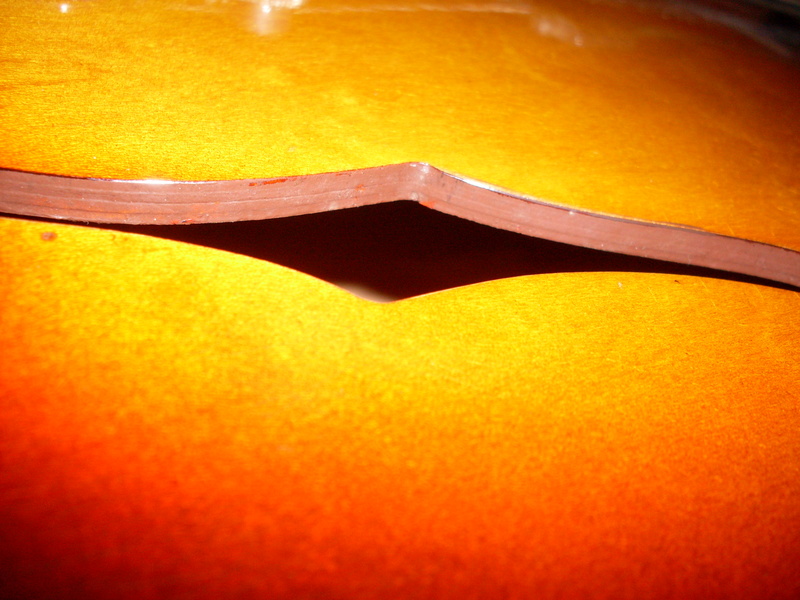 A 59 ES-335 has a kerfed layer of spruce between the maple block and the top (and back) of the guitar. Again, this was probably done to make the manufacturing process more streamlined and thus more cost efficient. This layer is visible inside the pickup routs but that layer in 58 doesn’t appear to be kerfed. Same with my early 59 with the thin top. But my later thin top 59 ES-355 does have the kerfed spruce insert. So my thin top theory is out the window. It’s easy to see the difference in the size of the heel. 58 is the only year they looked like this until the 80’s. Another small change is the size of the neck heel. The 58 is taller and rounder. By 59, the heel gets very short and more squared off. There is a fair amount of variation in heel sizes in a given year but they rarely are as large as a 58. I have a 65 that’s as tall but it is square across the top like most 59 and later examples. I don’t think the size of the heel makes a particle of difference in the stability of the neck join or in the tone of the guitar. It’s just another small change that the brass at Gibson thought was an improvement. I’ve read where folks think tenon is larger in these 58’s but it doesn’t appear to be. You can see the tenon in the photo that shows the non kerfed layer in the center block. It looks like most other years to me. Something that does make a difference to some players is the fret size. 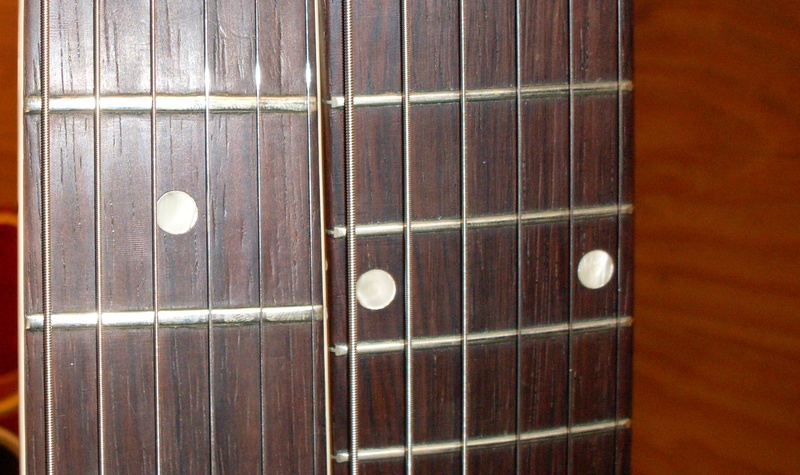 If you’re lucky to have a 58 with its original frets, you will see that they are pretty small. Not as small as “fretless wonder” frets but smaller than your average 50’s Fender by a little. Players who like big jumbo frets probably won’t like the 58’s but even the bigger frets from 59 onward aren’t as large as a modern “jumbo”. I find that if the guitar is properly set up, then the big bends don’t fret out but then I’m not a big bender. I’ve been on a few big benders but that’s another story. Oh, and something you probably never noticed…the tuners. Both 58 and 59 have single line single ring Klusons but the 58 is more likely to have the patent applied for designation rather than the patent number on the back. No difference, you say? Not true. It seems that someone at Kluson changed the formulation of the plastic for the tip around that time. Almost every 58 I’ve had still has it’s original tuner tips and nearly every 59 has those mummified, shrunken, falling apart tips. So much for improvements. Also pretty obvious. Little 58 frets frets next to bigger 59’s. I don’t get a lot of 58 ES-335’s. That’s mostly because there aren’t that many out there. Being the first year, I guess it took a little while for the design to catch fire with the players of the day. There were 317 335’s shipped in 1958. There were also 10 ES-355’s shipped in 58. By the next year, there were nearly 600 335’s shipped, not to mention the 300 ES-355’s and the 478 ES-345’s. While we tend to focus on year end transitions, it’s noteworthy that some very big changes occurred during 1958 and into 59. It seems they were making changes as they went along. The most obvious change was, of course, the neck binding. Somewhere around serial number A28365 they switch from unbound to bound. I’ve had A28763 in my hands and it was unbound. I’ve also had A28768 and it was bound. It was also a lefty which may throw things off but that’s as accurate as I can get. I’m really certain as to why the change was made but it probably had something to do with the unbound neck seeming a bit cheap looking at that $300+ price point. 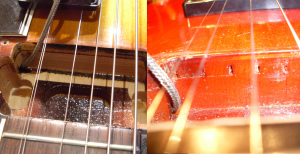 Gibson rarely made changes that made their guitars more expensive to produce and there are a number of additional procedures that are required to bind a fingerboard. This is a very early 58. Unbound fingerboard, thin ABR-1, pointy ears and a few other features you might not be aware of. The next really obvious (to me anyway) is the cutaway shape. Most of us associate Mickey Mouse ear cutaways with early 335’s but the really early ones are different. More pointy. Not as pointy as a 64 but not those big fat ears we all know and love. The best I can figure is that they made the change around serial number A28000. It’s hard for me to nail down because I haven’t seen any in the A278xx to A279xx range. But A28000 has MM ears and A27788 doesn’t. I should probably be going by FON’s rather than serial numbers but my database isn’t far enough along to do that. The next change didn’t actually occur until early 59. Most 335s have a 4 ply top that measures around .20″ but all 58’s and some early 59’s have a three ply top that measures only .15″. 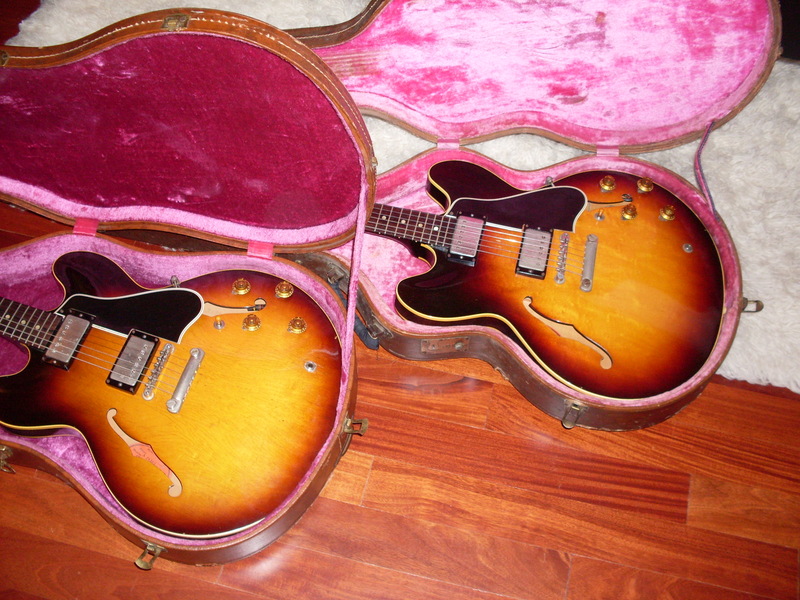 My 59 ES-355 which has a rather late serial A30877 has the thin top but 355’s were low volume sellers compared to 335’s, so the serial number becomes less dependable as a timeline. The FON on that 355 is S7625xx which is pretty early in 59. ES-335 serial A28950 is an early 59 that has the thin top but it has a 58 FON. So we know the thin top made it into 59. I’m just not sure exactly when the transition occurred. I do know why it occurred, however. Any one who has ever owned a 58 is aware of how easily the jack area cracks. Of the dozen or so 58’s I’ve had, all but three had top cracks, usually at the jack but often in other areas as well. The good news is that it is rarely through all three plies. Usually only the top ply seems affected. 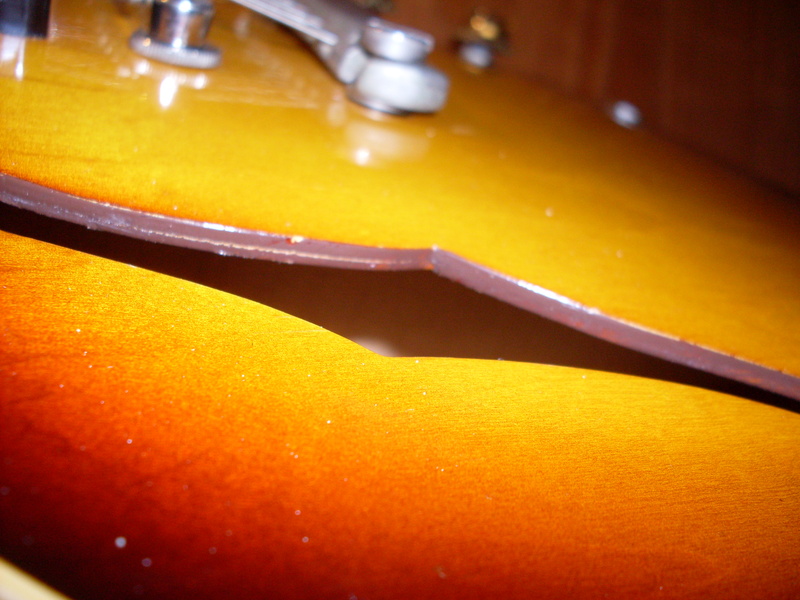 But it looked bad and Gibson must have been responding to customer complaints when they switched to the heavier top. It was probably a good thing but I have to say, I love the tone of a thin top 335. More air, less wood. Then there’s the little stuff. The change from the thin ABR-1 to the “normal” or sometimes factory shaved ABR-1 is just about impossible to determine since almost all of the thin ones collapsed and were tossed in the trash. I currently have A27771 and it still has its original thin bridge but that doesn’t tell us much. The existence of the thin ABR-1 is the result of the very shallow neck angles the early 335’s have. There is considerable range even within 58 but by early 59 the angle had been deepened a bit eliminating the need for the thin version. A28950 is an early 59 but the neck angle is such that the normal ABR-1 sits right on top of the guitar. Shallow angles existed much later but never again so shallow that the bridge had to be shaved. Did you ever notice the neck heel on an early 58? It’s bigger than the later ones. That went away pretty early. The center block changed as well. The early ones don’t have the spruce insert between the maple block and the top. The routs are also different in early 58. They are much cleaner and neater. Then there are the little frets and even a strange stubby looking stop tail version that shows up now and then. And the inlay position. I’ll go into more detail on the small stuff in my next post. Four ply thicker top on a 59.